Autumn is upon us here in the far north. 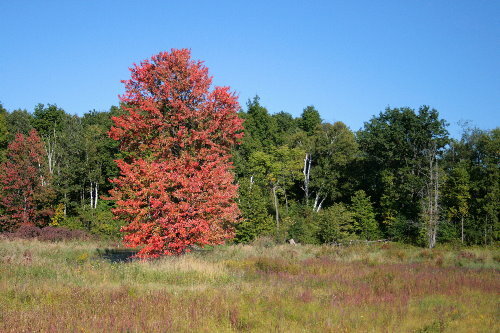 Although most of the trees still retain their green colour, a few are beginning to shift to shades of red or yellow. And a very odd few have already made the change. I spotted this strikingly red tree not far from the road along the route I take to pick up my CSA produce every other week. It’s a little hard to see in the photo, but it’s growing alongside a little creek. I’ve noticed that trees with their roots in water tend to change sooner than those on dry land, and I’m not sure why that would be. Are the trees more stressed, since they get less oxygen and/or nutrients to their roots? Does the water make their roots colder? I suspect I could probably turn up the answer with some digging around on the net, but I’m running out of time today – heading out to return to the Big City for a couple of days. The purpose of the trip is for a doctor’s appointment with my specialist in Toronto, but I’m taking advantage of the trip back to visit with some friends, as well. I’d hoped to schedule something to go up tomorrow (The Moth and Me is due up!) but don’t think I’ll be able to get to it till Wednesday. But look for The MaM here on Wednesday! A common late-summer flower is Butter-and-eggs, Linaria vulgaris, an introduced species that lines our roadsides and other disturbed places. The meadows here have a fair bit of it; I think these fields were cleared at some point in the last 50 years, and so are a fairly recent disturbance, as these things go. Fortunately, the plants seem to be well-visited by pollinators, suggesting that they do produce a lot of food for our local insects. This one is a bumblebee if undetermined species. It’s probably a Common Eastern Bumblebee Bombus impatiens, but don’t know if I could say for sure just from this photo. 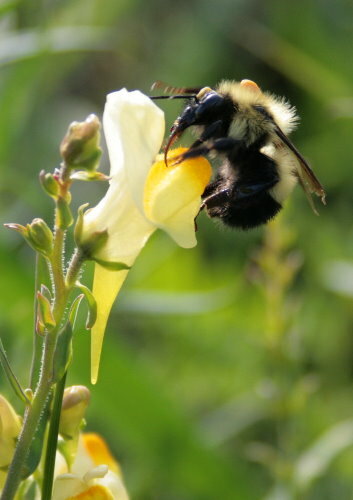 Notice that the Butter-and-eggs work a bit like snapdragons, with a lower “lip” that the bumblebee pulls down when it lands, opening up the flower so it can get inside. Presumably this prevents smaller pollinators from getting in. The bumblebee’s head and back are covered with huge mounds of pollen, deposited there by the flowers, which it will in turn carry to other flowers. Smaller insects wouldn’t be large enough to collect and transfer the pollen. My favourite part of this photo, though, is the bee’s long red tongue. Also, its right foreleg, which you can see waving about in the air by its head like another antenna. When the bee exited the flower, each time it would wipe the pollen from its eyes with the bristles on its foreleg. I found this secured to a branch in our cedar hedge. It’s the cap to a lepidopteran cocoon, though the inhabitant has long since left. I don’t know what species of caterpillar built it – it’s old and bleached and papery, leaving no clues that would help with identification. 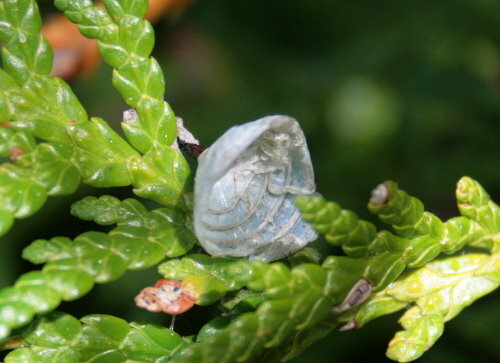 The rest of the cocoon would have been split open when the moth or butterfly emerged, and is long since gone, leaving just this little bit, resembling an acorn cap, hanging from the cedar branch. I noticed a few of these rolled-up leaves in our grapevines when I was checking on the status of the grapes (still mostly green – I’m looking forward to being able to make pie with them in a month or so). Looking down the tube you can see that it’s been secured by many silk threads. These are the work of leafroller moth caterpillars. 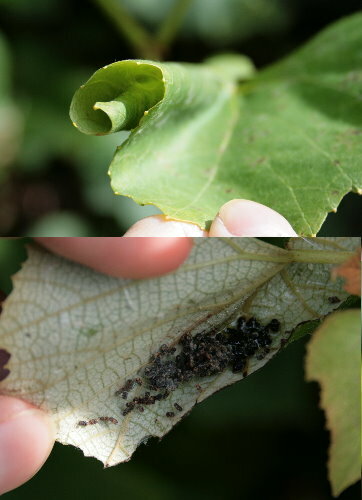 You’ll find rolled leaves like this not only on grapevine but also on other species of trees and shrubs. There are also leaf-folders, which just fold the leaf once instead of rolling it into a tube. I was hoping to find the caterpillar still inside, but when I unrolled the tube the owner had already left. All that remained was lots and lots of frass (caterpillar poop). In a Monday Miscellany from a couple of weeks ago I shared an image of a vacant Argiope web with its characteristic zig-zag. I’ve been seeing more and more webs with their owners present lately. This one is a Black-and-Yellow Argiope, Argiope aurantia. Most of the time the webs they’re sitting in are empty, but this lucky spider had caught not one, but two grasshoppers in its snare. The grasshoppers looked like they had once possibly been Red-legged Grasshoppers, but they were wrapped up and it was difficult to discern any field marks. Most spiders would be too small to handle these large grasshoppers, and it’s possible that if a Red-legged hopped toward the web of a smaller orb-weaver it might pass right through. Argiopes have the heft and size to entangle and consume large prey such as this. Our landlady, the house’s previous resident, planted a row of sunflowers down by our vegetable garden back in the spring. They grew very well over the summer and are just beginning to bloom. 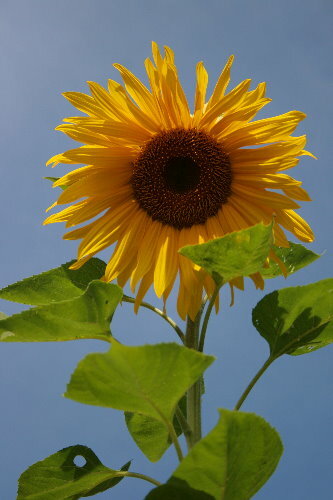 Sunflowers are such cheerful flowers, with their bright yellow faces held high to the sun. These ones are probably eight feet tall, towering over me. We’ll leave them where they are and allow the seeds to mature, and in the late fall and winter the Blue Jays and chickadees will enjoy hanging from the nodding flower heads to pick out the seeds. And finally, to wrap up this week’s edition, something a little different. I have signed up for a slot with Kolibri Expedition’s trip to Manu, Peru. My particular departure is set for November 13, 2010. Although there are a number of other bloggers also signed up to go, I’m hoping to entice some of my readers to come join me on this fabulous trip! It’d be a great way to escape the dreary November weather, and you’ll still be back in time for the American Thanksgiving. You can read more about the details and itinerary here. In the meantime, I thought I would end my miscellany posts by choosing a species that will likely be seen on the trip and sharing a bit about it. Needless to say, because I haven’t been to Peru the photos will not be my own – but they will all be ones labeled for Creative Commons use. The photos will click through to the original source. 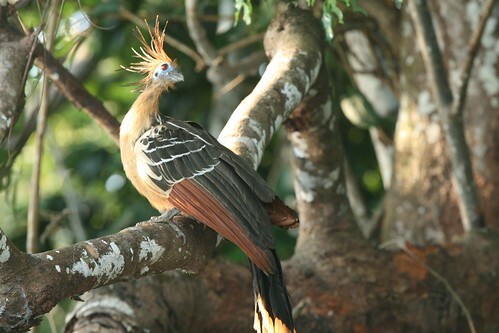 This first week I selected Hoatzin. This might be my number one desired species for the whole trip. They are just such cool birds. Considered by many scientists to be the “missing link” between the prehistoric Archaeopteryx, young Hoatzin bear claws on their “wrists” that they use for clambering about in the trees. Even adults do more clambering than flying, partly because their flight muscles are reduced in order to accommodate a larger stomach. Their stomach, in turn, needs to be larger because of the birds’ diet. They feed primarily on leaves, with only small amounts of fruit, flowers or insects. The leaves are broken down in an oversized crop using bacterial fermentation, much like cows and other ruminants do. However, unlike cows, the Hoatzin only has one stomach. Because of the bacterial digestion, the birds apparently have a rather manure-y smell, leading to the local name of Stinkbird. They can be fairly tame, for a wild bird, perhaps because their smell has discouraged much predation from humans. I’d love to go bird Peru with you, especially since I own the way cool, “Birds of Peru” that I desired after reading about it in Drawing the Motmot. I did get to see Hoatzin in Ecuador, they hung out by the lake. Definitely cool birds. I’ve also used this one to determine what bees possibly live in the Arctic. Thanks for the links. I wasn’t aware of those sites, but they look useful – I’ll have to bookmark them. Oooo – enjoy your Peru trip! I went in Jan/Feb 2000, and it was the best! We did 10 days in the Amazon, then a week and change in the Andes (Machu Pichu). We saw Hoatzin at this small pond off the Amazon River. I didn’t get good shots because I was in the back of the second boat, but my friend got some good pics and sent me copies. I think my favorites, though, were the pygmy kingfisers. Thanks, Ellen! It sounds like you had a great trip! It’d be such a fabulous place to visit, I can’t wait. I envy you the trip to Peru. What a beautiful, magical place. I visited friends down there several years ago and didn’t want to leave. I think you’re going to have a splendid time (at least I certainly hope you do!). Thanks, Jason! I’m sure I will, if/when I get down there. Need to find some traveling companions to make sure it’s a go!